Non-knitters often ask what they can make with the yarn they’ve dyed (http://mother-natures-backyard.blogspot.com/2012/10/solar-dyeing-with-native-plant-trimmings.html). In fact, there are a number of crafts that use colored yarns. 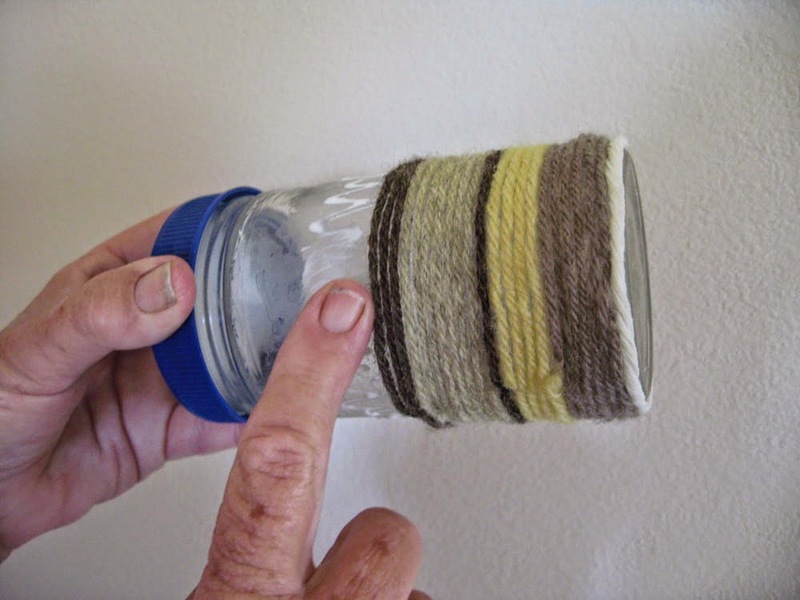 Making a yarn-covered vase, bottle or container is one such craft. We like it because it’s thrifty and sustainable; you recycle containers and left-over yarn into unique vases, boxes and jars. This is a fairly easy craft; you may have actually done it in school. It’s a great way to use up scraps of yarn, and is a wonderful rainy day activity. It does take a little practice, but you’ll pick up the technique quickly. Once you have some practice, you can introduce the craft to children (we suggest 4th grade and up – and using rather thick yarn for a beginning attempt). A bottle, jar or container to cover. Start with smaller, straight-sided ones until you get the hang of it. Glass and cardboard are a little easier to work with than plastic (at least in our hands). Plastic, wood or cardboard ones recommended for children. White glue (Elmer’s or liquid school glue). Use the kind that dries clear. 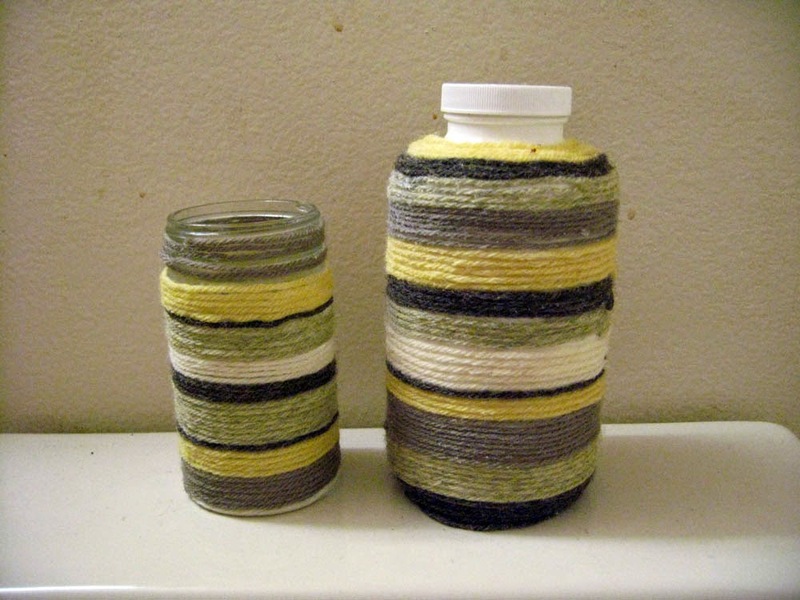 Yarn of several colors – you’ll need 10-15 yards (meters) total, depending on the size of the bottle/jar/container. Any yarn but the fancies and very thin yarns (which are too hard to work with) will do. Wool, acrylic, hand- or commercially dyed – or a combination – can be used. If doing this craft with children, use the thickest yarn you have. Acrylic yarn may be easier to work with at first - it usually stretches less than wool. 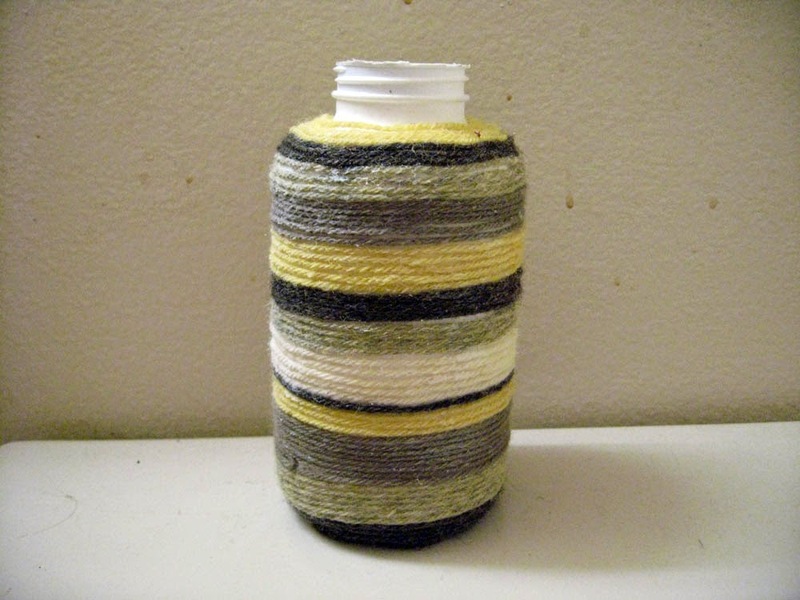 Piece of bulky yarn or string (enough to go around the container once plus a little extra). It’s best if the color is neutral (white, brown, gray or black) or complements the other yarns. Paper or a large trash bag (to protect the work surface in case of drips). If using jars or bottles, remove paper labels (soak in warm soapy water overnight) and thoroughly wash the insides and outsides. 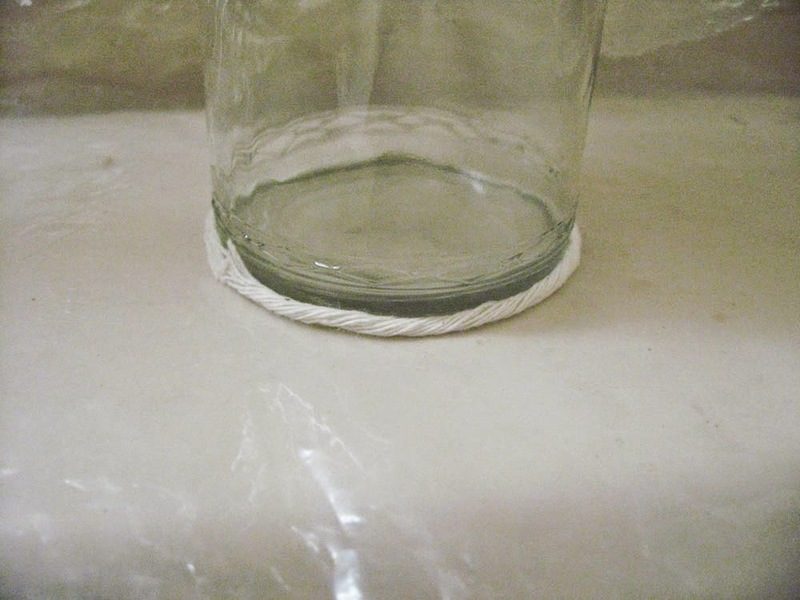 Be sure that the jar/bottle/container is completely dry before starting the project. Spread out paper/trash bag on the work surface. Choose a selection of yarns that look nice together. We suggest using yarns that are all the same thickness for your first project. We also suggest choosing three or five colors, if possible. Be sure that the yarns are straight, with no kinks or knots. Spread a line of glue at the very bottom edge of the container. Let it dry for about 1 minute. Take the bulky yarn or string and place it over the glue (to glue it in place). Cut off any excess length and be sure that both ends are well attached (use a little extra glue if needed). Place the container right side up on the work surface. 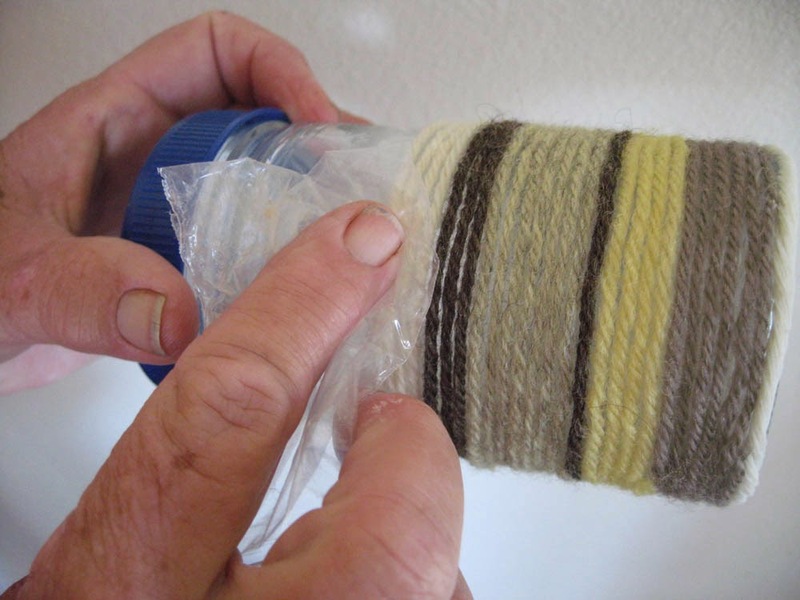 Using the piece of plastic wrap, gently work the bulky yarn/string into place at the very bottom of the container (where the container meets the work surface). Press the yarn/string in place, flattening it slightly against the container. 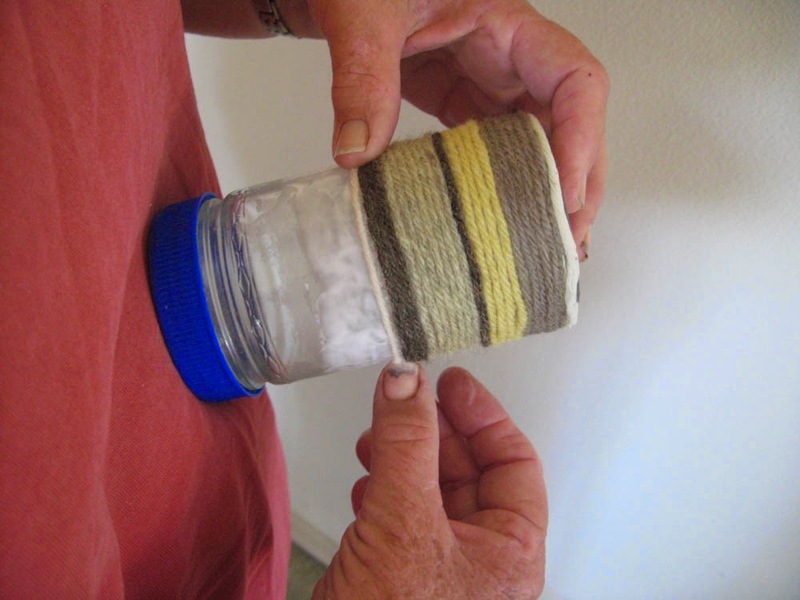 It’s important that the yarn/string is well-glued and even with the bottom of the container; this will form the base for subsequent layers of yarn. Let the foundation layer dry completely before adding color layers. Choose the first color and lay out a straight piece that’s long enough to go around the container 3-5 times. Squeeze out a wavy ribbon of glue (a bit wider than you want your first color layer – ¾ inch is fine) just above the foundation layer. Smooth the glue with your finger to make a thin, even coating. Let the glue sit for about 45-60 seconds or until slightly tacky (time to wash your hands). Lay the yarn in place, starting just above the foundation layer and continuing around the container. If working with wool (or other stretchy yarn) be sure you don’t stretch the yarn. Continue to lay the yarn on the glued surface, around and around, until you run out of yarn. Be sure both ends are firmly glued (use a little extra glue if needed). Using the piece of plastic wrap, gently push the yarn layers together (down) so there are no gaps where the container shows through. Then flatten the yarn against the container surface so it adheres to the container. You will have several minutes before the glue hardens, so take your time. You can add a little more glue if needed. We suggest letting each layer dry for at least 30 minutes before you add the next layer. It’s much easier to add a new layer when the one below it is dry. Continue adding color layers, following the steps above, until the container is covered. Let the piece dry thoroughly. 8. Spray with a fixative (optional) to make the vase/bottle/container waterproof. If using a fixative, we suggest one of the non-toxic varieties. We hope you enjoy this craft and that your unique new vase, bottle or box gives you years of enjoyment. 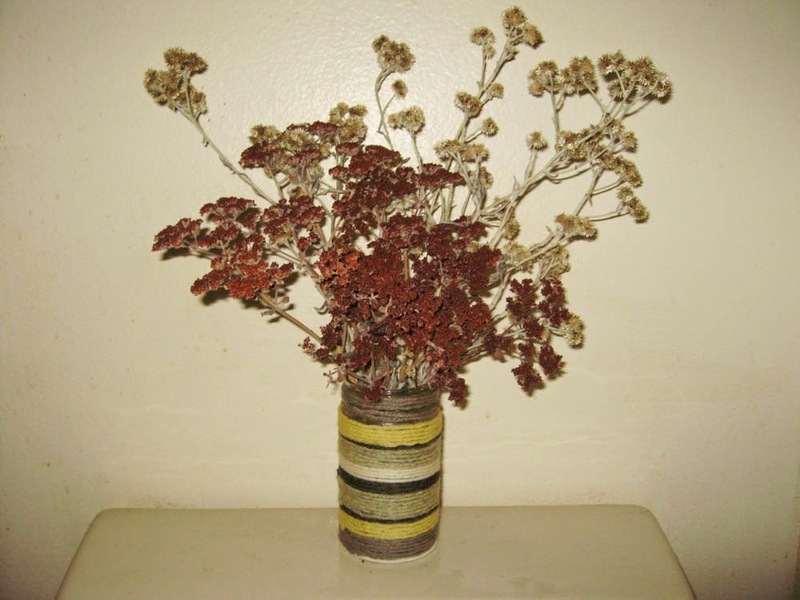 We like to use our vases with dried flowers. The vase above has dried seed heads from Giant buckwheat (http://mother-natures-backyard.blogspot.com/2013/08/plant-of-month-august-st-catherines.html) and flowers from Felt-leaf everlasting (http://mother-natures-backyard.blogspot.com/2013/09/plant-of-month-september-wrights.html). October is the heart of the dormant season in Mother Nature’s Backyard. This is a pleasant time of year, but not a lot is blooming. 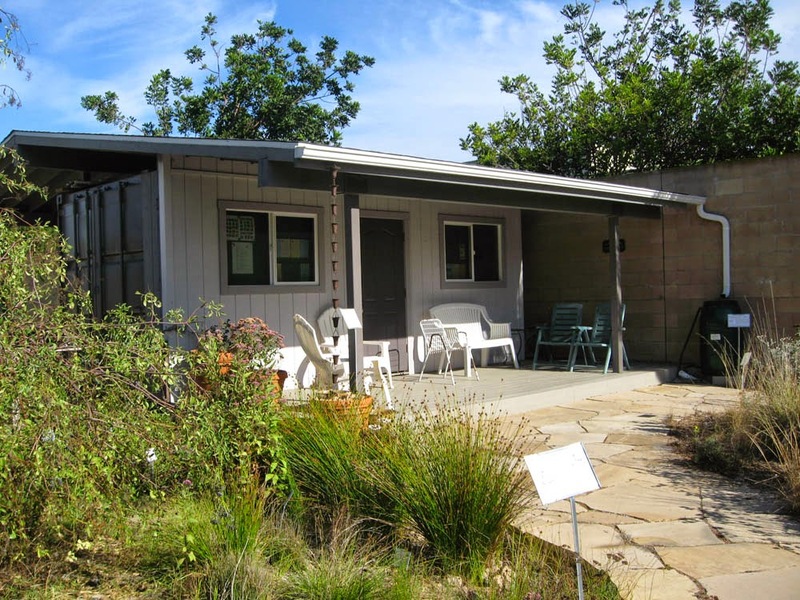 If you didn’t catch our posting on ‘The Year in a S. California Garden’ (Sept/2014) you might enjoy reading it. One of our showiest plants right now is, surprisingly, a rush. Of all the grass-like plants, Torrey’s rush is clearly the diva this time of year. Torrey’s rush (Juncus torreyi) honors Dr. John Torrey (1796-1873), American botanist and co-author (with Asa Gray) of The Flora of North America. It grows wild in most of temperate North America, from southern Canada to northern Mexico. 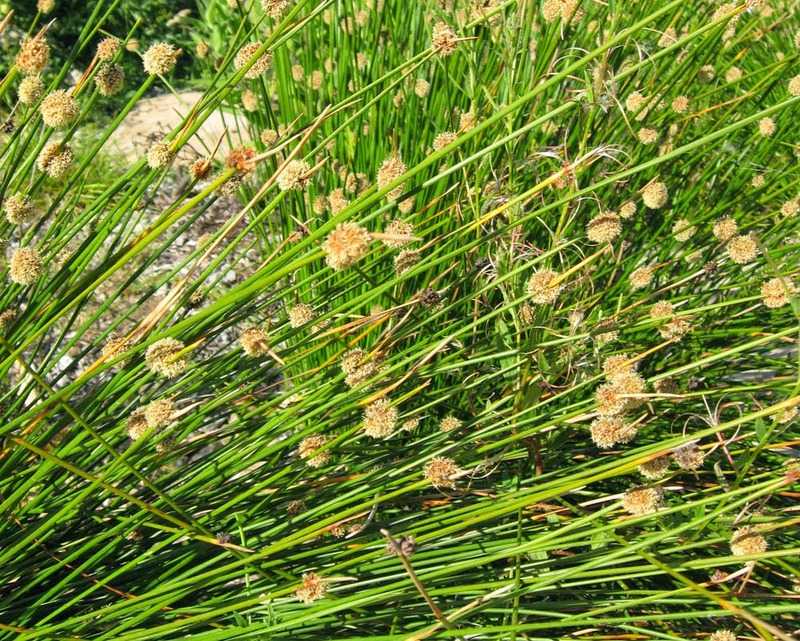 In Los Angeles County, Torrey’s rush can be found in the San Gabriel, Santa Susanna and Liebre mountains; it once also grew along the L.A. River. Not surprisingly given its wide geographic distribution, the physical (phenotypic) characteristics of Torrey’s rush vary somewhat across N. America. Torrey’s rush is a good example of a rush. Most people have heard of rushes. They grow in/near wetlands in most parts of the world and are often used in basketry and other local crafts. But many people don’t know exactly what a rush is and how it differs from other grass-like plants. 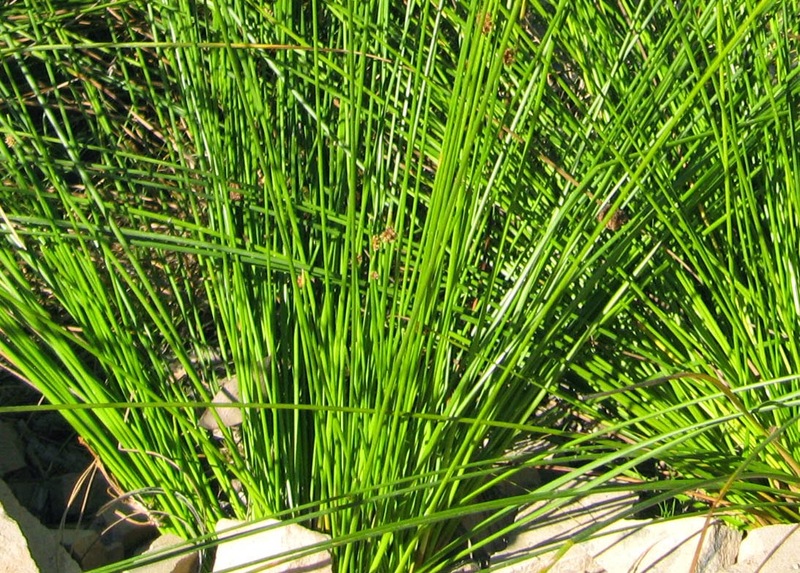 Rushes (family Juncaceae; genus Juncus) are grass-like perennials. Along with grasses and sedges, rushes are monocots (monocotyledons), plants with a single seed leaf. The other large category of flowering plants, the dicots (dicotyledons) have two seed leaves. Unlike grasses – which have flat leaves or ‘blades’ - rushes may have only rudimentary leaves. Their stems are round in cross-section. In fact, a good way to remember the difference between rushes and sedges is the old saying ‘rushes are round and sedges have edges’. Sedges, with triangular stems, do indeed have edges. Rushes have rather distinctive flowers, in five whorls of plant parts arranged like spokes of a wheel around the flowering stem. The flowers are usually white or green-gold to pinkish, small and not as showy as many common garden plants. That may explain why this group has received less attention than it probably deserves. 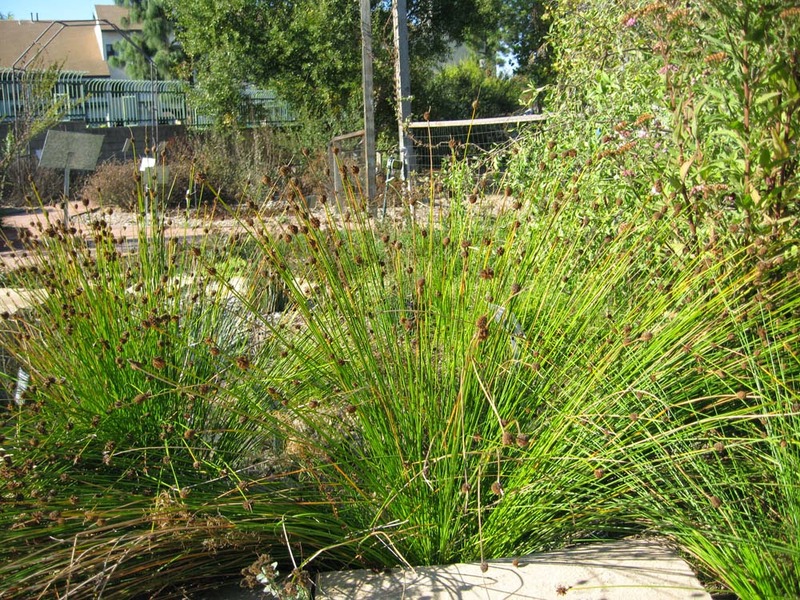 In the wild, Juncus torreyi grows in moist areas, including marsh and stream edges, in wet meadows and around lakes/ponds. Because it tolerates somewhat alkali and salty conditions, it can also be found in brackish tidal marshes, alkali sloughs and other locations with moist, alkali soils. In colder climates, Torrey’s rush is usually a slowly spreading component of a complex ecosystem that includes many species of rushes and sedges. 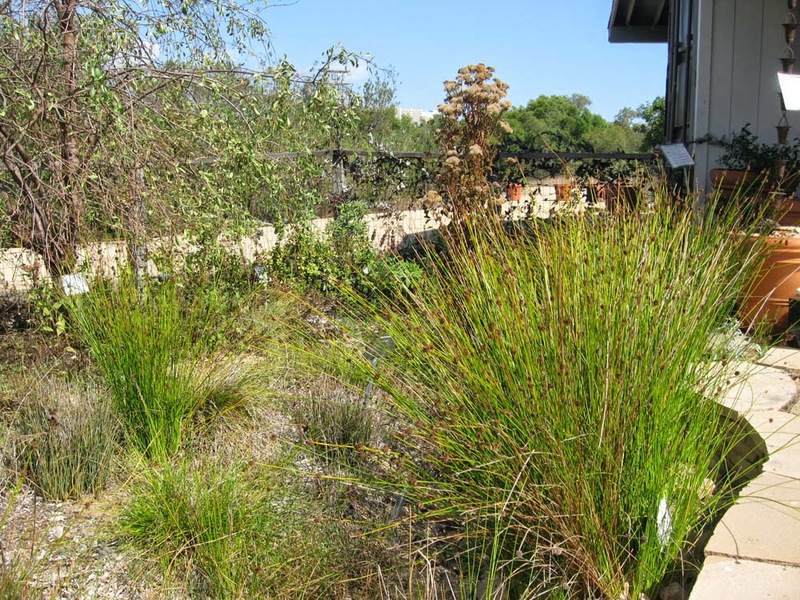 In warmer climates – and particularly when competing wetland plants are absent – it spreads easily, creating dense stands if conditions are favorable. In fact, this is one thing to remember when planting Torrey’s rush. 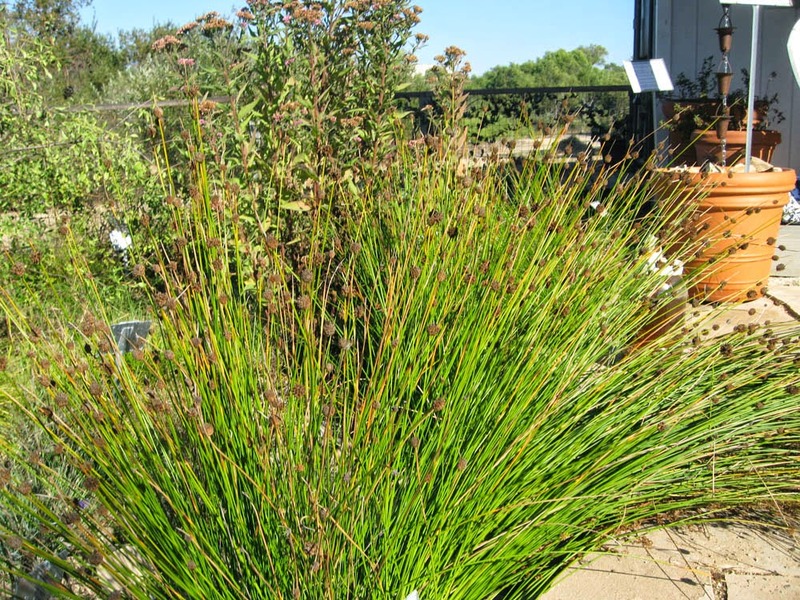 The stems of Juncus torreyi are a pleasant medium green. In lowland S. California, the plants look best in spring and fall, when days are sunny but soils a bit cooler than in summer. The stout, un-branched stems are 1-3 ft tall, emerging from an expanding clump. The stems create a fountain-like cluster that is neat and attractive (see above). Torrey’s rush reproduces both vegetatively (via underground stems or rhizomes) and by seed in western Los Angeles county. New plants from rhizomes emerge at distances of six inches or more from the parent plant, often when the ground warms in spring. You can dig them up when the ground is moist and plantlets are small. In addition to attractive green foliage, Torrey’s rush has some of the most attractive flower and seed heads of any native rush. Plants flower in summer – usually June to July or early August in coastal S. California. The flowers are arranged in spherical clusters, about ½ inch in diameter, which are green-pink in summer. In fall, the mature seed capsules, which are narrow and pointed, give the cluster a bristly appearance. Their color, shape and size are unique and showy (see below). Torrey’s rush reproduces very well by seed in lowland S. California. In fact, you may find new little seedlings in moist areas of your garden. The tiny seeds are spread by wind, water and even on the feet of waterfowl. Fortunately, seedlings are similar in appearance to their parents and easily identified. We suggest pulling them up when small and easily uprooted. Larger plants have tenacious roots! 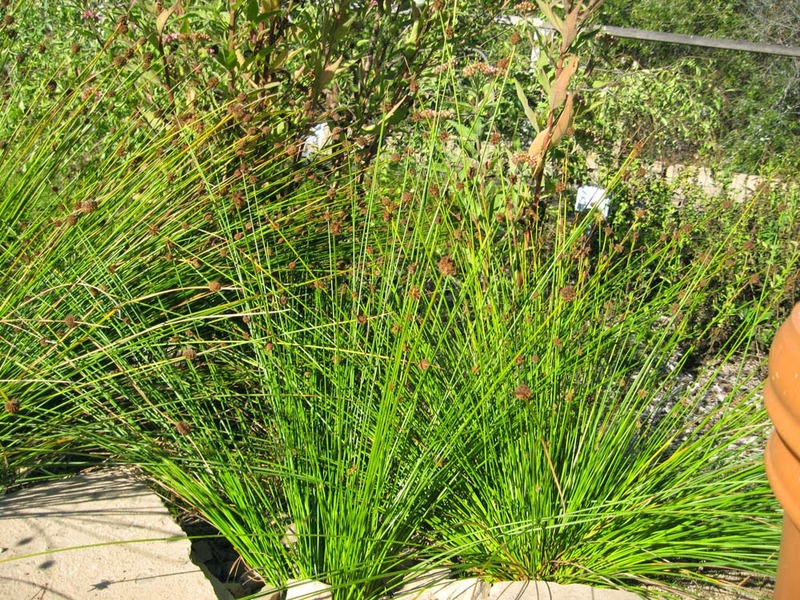 Like most rushes, Torrey’s rush likes full sun and regular to occasional summer water. In our clay soil, we water this plant every 2-3 weeks in the heat of summer. Plants are not particular about soil texture and do wonderfully in clay. They can tolerate slightly alkaline and salty soils. This is a very easy plant to grow, requiring only minimal effort. Old, yellowed stems should be removed in early winter and the entire clump can be cut back to 2 inches to rejuvenate it. Anyone who grows Torrey’s rush needs to watch for seedlings and remove unwanted plants promptly. They can pop up any place that gets regular water, including in pots. That being said, Torrey’s rush is a lovely addition to the fall garden. It adds a decorative vertical element to the garden design. Its fresh green stems and showy flower/seed heads are a welcome sight in fall. 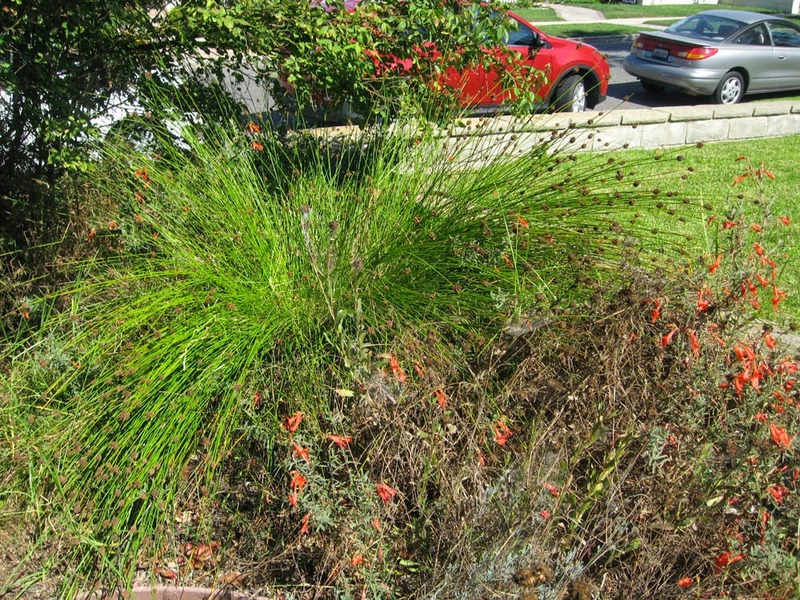 We like Torrey’s rush in containers and around the edge of rain gardens and infiltration swales. It’s a useful background plant in areas that get a little extra water. The species is often used in wetlands restoration projects, particularly in areas where its roots can stabilize banks. Birds - particularly Lesser Goldfinches in Mother Nature's Backyard - occasionally eat the seeds.